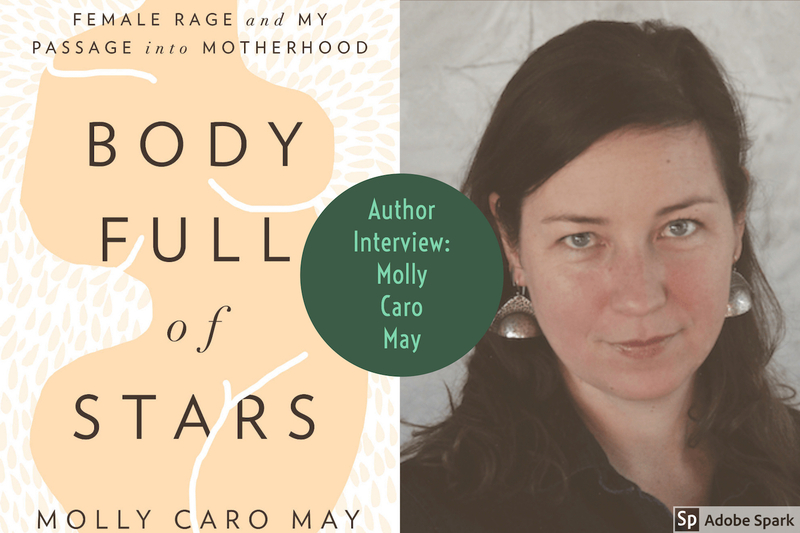 Today I am honored to share with you, this Q & A exchange I recently had with author Molly Caro May. While we’ve run in the same circle of friends for much longer, I officially met Molly five years ago when I finally enrolled in one of her memoir writing classes. Since then I’ve taken a couple others from her as well as some shorter workshops. 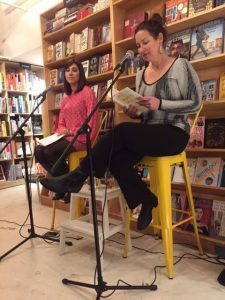 I am proud to call her a mentor on my writing journey. 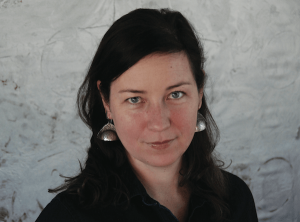 Molly Caro May is a writer whose work explores body, place and the foreign. She teaches writing workshops across the country, though once cut her teeth as a fruit-picker and artist’s model. 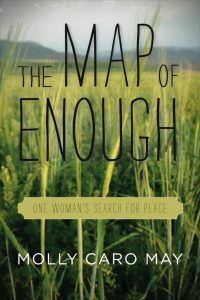 Molly’s first memoir, The Map of Enough, was called “addictive” by Elle Magazine. She is co-founder of the Thunderhead Writers’ Collective and received a writing fellowship at the Taft Nicholson Environmental Humanities Center, where she wrote the first draft of her second memoir, Body Full of Stars, which was published in January 2018. Most days, Molly would would take exploring over sitting at a computer, which is why she tried to stand up when she writes. 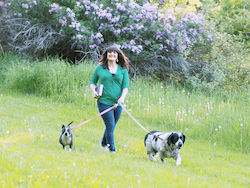 She is a graduate of Middlebury College and lives with her husband, daughters, and tiger dog in Bozeman, Montana. 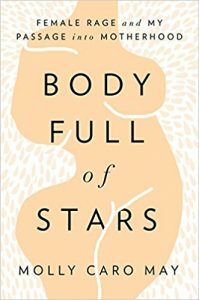 How did writing and publishing Body Full of Stars differ from your experiences with your first memoir? BFOS came out of me during a 12-day residency. I wasn’t trying to get “in” to the publishing world because I already had written a first book. So I felt more liberated, more able to do whatever I wanted to do. 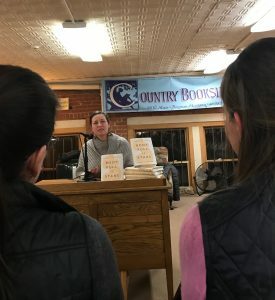 With my first memoir, I was constantly trying to prove that I was “good enough” and having this huge doubts, like, “Who would even want to read this.” With BFOS, I knew there were women out there who would benefit from the book; not because I’m anything special, but because the message is very universal and has not been discussed enough, it’s taboo. How has BFOS and your subsequent appearances (both with and without your husband, Chris) done for your marriage? This is a both/and. It was very healing for us. It was healing for me to write the book. It was healing for us to co-share our story publicly in Bozeman. The book also, however, is this THING that lives and breathes even as we try to live beyond the experience of it. We’ve had arguments where the book comes up, as something I “got” to do, and he didn’t; or it keeps me trapped in this old narrative. It’s easy to reference. But on the whole, it’s been positive and transformative for us. How do you feel about your story (BFOS) now compared to before it was published? About the same. I am, though, very ready to distance myself from “postpartum” and not in the sense that I don’t want to be an ear for other women, but I’m ready to move into a new phase of life. The story no longer has heat for me. It’s lost its charge. That’s the gift of writing. The story doesn’t live inside my body anymore. Now there’s space for something new. A while back, you shared your thoughts with me on reading your own book reviews, along the lines of you’d rather someone have a strong negative emotional response to your work than none at all or say it was “meh.” Is this still accurate for you in regard to BFOS and the work you have done since? <YES! Good art makes conversation. My agent and I knew this book would trigger people. That means people are thinking, pondering, re-evaluating, or just pushing back, which invites others to push back on them. All good. How do you and Chris manage (if you do) not to take the harsher responses personally? I’m thinking particularly of the comment on YouTube “This chick is mental and her husband suffered for it.” Is it “easy” to let that stuff roll off? When I first saw that comment, I laughed. Because in some ways it can feel true. I sometimes feel like I rolled the dice of mental illness. Chris did suffer during this time. But so did I. And we both learned a lot. I also recognize that the man who made that comment is very uncomfortable with truth-tellers. Too bad for him. I feel proud of my story and, in no time, some folks jumped on and let him have it. So….. Regarding your TEDX Talk, have you gotten any response from your grandmother’s friend you reference? I never sent it to her. Haven’t yet. Still thinking about it. I’ve never met her personally. I noticed your oldest daughter, Eula, was in the audience for your TED Talk. Are your girls old enough to be aware of the subject matter of your books and talks/readings? Do they ask questions? Eula was there because it was her birthday. She knows that I wrote a book about her and my love for her and my body. She doesn’t know what postpartum rage or depression is. I am very careful not to tell her that I suffered after she was born because, at her age, she would interpret that as her fault, or she might think that, if she choses to have children, she will suffer. I want her to have a clear and clean narrative of her own to shape. I do tell her that mom’s have to regain their strength after having a baby and nursing. I explain that birth and nursing are there own strength but it requires a lot from the mom. She was focusing on me and not as much on what I was saying. She knows I’m a truth-teller. I think a lot of it went in one ear and out the other, especially because there was a big crowd and she was the only little kid. Now, had we been in a kitchen and had I been talking to a friend, she would have been listening carefully. So, I’m aware of the situation and when she is likely to be listening. 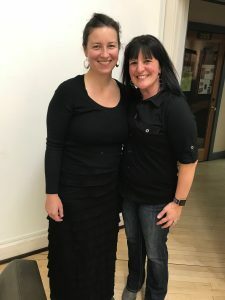 We’ve spoken previously about the natural divide (for lack of a better term) created between women who choose to become mothers and those who do not. I understand how shared experience is bonding, however when I read about your experiences during and after pregnancy, knowing I was in your life at the time, it was heartbreaking. Being unaware of many of those experiences of pregnancy/birth/post-partum, I was deeply saddened to realize how many of the women I’m close to have likely had similar experiences while I was completely unaware. How would you suggest a women who chooses not to have children can not only be there for the mothers in my life, but also let them know I am open to them sharing? In there words, how can we as women bridge that divide? It is a divide, isn’t it? I think we come back to our shared womanhood. The best thing for a woman without kids to do for a woman who just had a kid is to ask questions. How is this for you? Can you tell me about it? To show interest, instead of disdain or jealousy or distance because she has made a different choice. And that goes in reverse. I try to be super aware of asking my friends who have chosen not to have kids about their life with as much gusto and interest as those who have kids. Obviously. Because I love my people whether they are parents are not. The trickier one is perhaps mothers talking to women who want to be mothers but have fertility challenges. I feel so much ache for those women. But, it’s true that shared experience makes conversation easier. I can talk to a mother about sleep deprivation and she will REALLY understand. I don’t think this is a bad thing. It’s just how being human works. I love this quote, “The story no longer has heat for me. It’s lost its charge. That’s the gift of writing. The story doesn’t live inside my body anymore. Now there’s space for something new. ” Very powerful. I feel that way too. I hadn’t run across Molly before. Interesting information- and thanks for the share. I’m so glad this post resonated with you. I’d say one of the biggest things I’ve learned from Molly in regard to my writing is to go where the energy is. If a project loses it’s charge for me, I let it go and move on to wherever I’m feeling it most. Writing let’s the story out.It’s healing indeed.An inspiring interview. Very interesting theme. Thank you.